Paradise Papers: Who is in control of Everton? Questions have been raised in the leaked Paradise Papers about who controls Everton FC and whether Premier League rules have been broken.Farhad Moshiri sold his Arsenal stake in 2016 to buy nearly 50% of Everton.But the leaks suggest his original Arsenal stake was funded by a "gift" from oligarch Alisher Usmanov, who owns 30.4% of Arsenal, raising the question of whether his money is now in Everton. Mr Moshiri strenuously denied the money was a gift.Lawyers acting for him in the Everton deal said any allegation Premier League rules had been violated were wholly false. They say Mr Moshiri is independently wealthy and funded the football investments himself.Mr Usmanov's legal representatives said there were errors in the allegations and that the investigation was a gross intrusion into their client's privacy. Gallagher Holdings is also an Usmanov company. Lawyers acting for Mr Moshiri originally denied that the money had come from Epion.They later admitted the initial funding had come from Epion, but said Mr Moshiri had subsequently paid Mr Usmanov back.Red and White Holdings continued to raise its stake in Arsenal, reaching 30.4%.In February 2016, Mr Moshiri sold his half of the Arsenal shares to the Russian oligarch.A document in the Paradise Papers from Appleby, the firm overseeing due diligence on the deal, confirms the sale was used to raise funds to buy a 49.9% stake in Everton. The reported price was ?87.5m. A Russian media company with close links to Mr Usmanov initially reported the Everton deal as "Russian businessman Alisher Usmanov has become the new owner of Everton". The report was soon taken down but suspicions were aroused.The suspicions rose further this January when it was announced Everton's training ground, Finch Farm, was now being sponsored by Mr Usmanov's company, USM Holdings. The training ground has been renamed USM Finch Farm.When BBC Panorama approached Mr Moshiri and asked him whether Mr Usmanov was in control of Everton, he asked: "Are you crazy? Have you seen a psychiatrist? "He said: "If it is a loan, you owe the money back to him. If it is a gift, it is yours. It is neither of them because I paid for it. "Mr Moshiri later said that all the documents that mentioned a gift were "a mistake".Mr Moshiri's legal representatives said the Premier League had carried out checks, including on its funding, and was satisfied that he had complied with its Owners' and Directors' Test.They also said that Mr Moshiri, who is listed by Forbes to be worth $2.4bn, had subsequently provided considerably more finance to Everton.Former FA chairman Greg Dyke told Panorama that a gift "sounds unusual", adding: "If these papers say what you say they say, I feel sure that the Premier League will want to do their own investigations." The outcome of any investigation would depend on what the two men did and what the clubs knew.When asked about the matter, the Premier League said it "would not disclose confidential information about clubs or individuals".The Everton deal was administered by Isle of Man company Bridgewaters Limited.Other documents in the Paradise Papers suggest that Bridgewaters was secretly taken over by Mr Usmanov in 2011. This is strongly denied by Bridgewaters and Mr Usmanov.Blue Heaven Holdings, the company that owns Everton, has its registered office at Bridgewaters and its two directors are an employee of Bridgewaters and an employee of Mr Usmanov's company, USM Holdings. Lawyers for Mr Usmanov said there were "errors of fact and interpretation" in the allegations but gave no further details.They said: "Our client is not obliged at all to assist you in your enquiries. It is not for him to do your journalists' research which on its face appears to be biased. "In May, Mr Usmanov failed in a ?1bn bid to buy out major Arsenal shareholder Stan Kroenke, a move that would have left him with about 97% of Arsenal shares.Mr Usmanov is known to be frustrated at his inability to influence Arsenal and has no seat on the board.Both clubs have had their problems on the pitch. 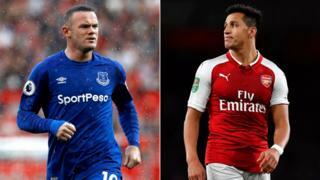 Many Arsenal fans have questioned whether manager Arsene Wenger should continue given the recent lack of league titles, while Everton sacked boss Ronald Koeman after a poor start to the season.The teams met at Goodison Park on 22 October, with Arsenal running out 5-2 winners.